For Production-Quality Solder Joints Complete with Fillets at the Bench! Always Make Sure PCB Assy is Level and Secure. Place your PCB Assembly into the ABC-1 Adjustable Board Cradle and above the ZT-1 AIRBATH as shown at the left. Apply Bead of Solder Paste. 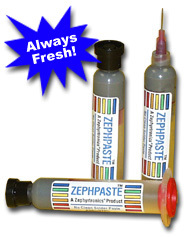 With the appropriate gage of paste application tip (See Selection Chart Below), apply a continuous bead of solder paste down the middle of the pads (Recommended: Zephpaste SPE-0012) as shown here. Pick and Place Chip. Using an ESD safe, and soft vacuum lifting device such as the ZT-3-MIL AIRPICK, lift and gently place the selected SMD on top of the bead of paste above the corresponding pads. Adjust Alignment if Needed. After placing SMD, check so all leads and pads are aligned. "Fine tune" with a stainless steel SMD or Dental Probe as shown. Recommended (SMT Probes SDP-1111). Always Preheat. First, switch on the ZT-1 AIRBATH to "Warm" at industry recommended setting of 150°C. How long? The process itself will tell you. When bead of solder paste runs (30-60 sec), flux has activated and the PCB is preheated. Cool Down & Final Cleaning. Flip rocker switch of ZT-1 AirBath to "Cool" mode to cool down PCB. Dip a large anti-static foam swab into non-flammable flux solvent or remover. (Recommended: Non-Flammable Flux Remover). Swab PCB with Flux Remover. As PCB cools under ZT-1 AirBath, swab area where SMD was placed and reflowed to the pads with Flux Remover as shown. Turn off AirBath. Inspect. (For graphic contrast, a white foam swab is shown at left.). Above: An inferior "tack" solder joint made with the traditional, contact soldering iron and solder wire. At best, only a tangential joint is achieved at the lead/pad interface. Such inferior joints are no more acceptable from the bench than they are from a conveyor oven or wave solder machine. A bead of solder paste is applied to the pads, followed by placement of the SMD onto the pad and seated into the paste. Next, a brief preheating of the bottom side of the PCB is made. After 30-60 seconds, flux activation begins (solder bead begins to visibly level). A localized, pin-pointed reflow of solder paste is made at each individual lead/pad interface with a low velocity hot air pencil. Solder wets and wicks up to the lead's toes, heels and sides with production quality fillets. It's elementary: A solder joint made at the bench with the same materials and processes used in premium production conveyor ovens will be the same. 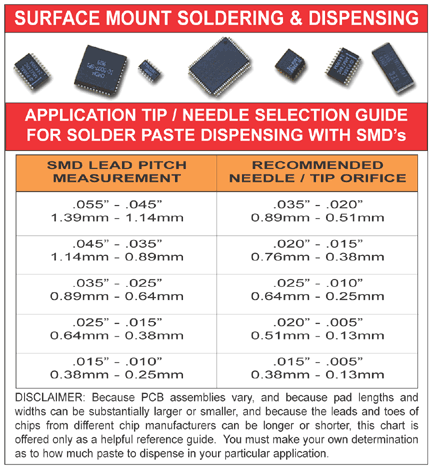 For a more in depth look at SMD soldering, please refer to "Making High Quality Solder Joints at the Bench". Available in UnLeaded & Leaded Alloys! The above example is made with a "gull winged " SOIC 20. This same method works equally well with the "J" leaded PLCC's. For finer pitched components, such as the popular QFP 100 and the QFP 208, a slight variation in technique is easily made with equally, if not even more effective results (call Zephyrtronics for details...we can't teach our competitors all of our tricks). For SMD Component Removal, please be sure to see LowMelt® Process of Co-Metalization and Rapid SMD Removal in Less Than 180 Seconds and learn more about the history and benefits of the popular Zephyrtronics LowMelt DeSolder®. Please note: Zephyrtronics has conveniently packaged all of the above described chemicals, Zephpaste Solder Paste, Anti-Static Swabs, SMT/Dental Probes, LowMelt® DeSolder and more in the LMK-1000 SMD Benchtop Kit our Blueprint for the Bench™, or best of all, please visit our "Systems Section" in this Website where our more popular, comprehensive benchtop systems are graphically presented. ©1996 - 2011, 2012, 2013, 2014-2016, 2017-2018 Ameritronics®. All rights reserved. The information you receive online from Ameritronics® is protected by the copyright laws of the United States. The copyright laws prohibit any copying, redistributing, retransmitting, or repurposing of any copyright-protected material. Ameritronics® is the registered trademark property of JTI, Inc. "Zephyrtronics" and "Zephlux" and "ZeroLead" and "Zero Balling" and "Zero Residue" and "Post Cooling" and "PostCooler" and "AirBath" and "Quatro" and "Full Metal Jacket" are the protected trademark property of JTI, Inc.